Part of our vision is ‘happy together, growing together’. In order for our children to do this they need to develop confidence, the skills needed for positive, trusting relationships, and the knowledge of how to keep themselves safe. Keeping safe online and whilst using digital technologies is an important part of this. We know that our parents and carers want to work with us to enable our children to make informed and safe choices. We hope the following resources will be helpful to you. The UK Safer Internet Centre provides resources to promote the safe and responsible use of technology for young people. 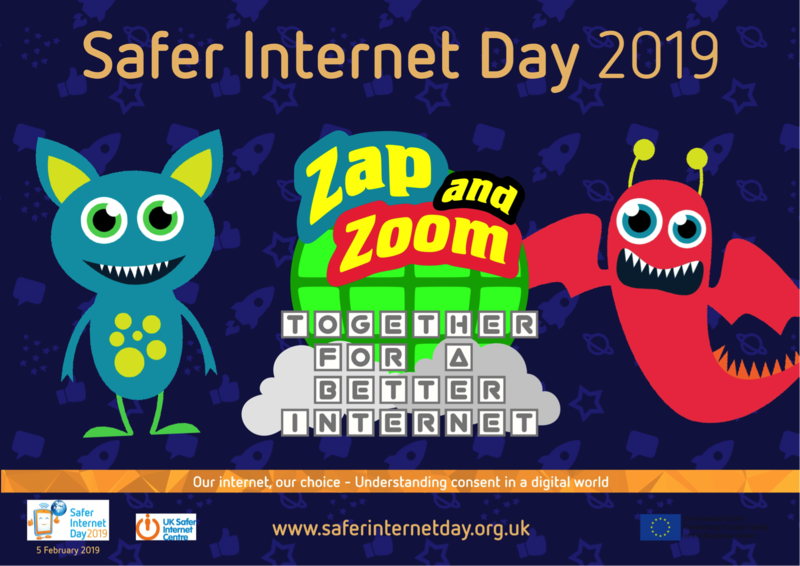 They provide the resources which we as a school use for the annual internet safety day. They also have an advice centre for parents, carers and schools. This advice includes how to set up parental controls and links to Children’s Parents and Carers Zone. This link will take you to their film for this year: Zap and Zoom –A space Race, designed for chidlren from 3 to 7 years old. Thinkuknow is the education programme from the national crime agency. It contains resources for children from 5-7, 8-10 and above, including a series of films including the characters Hector and Lee and Kim. The NSPCC also has a range of materials for parents and carers to help keep children safe online. These include the booklet ‘A parents’ guide to being Share Aware’ a video, ways to start a conversation with your child and links to an O2 Guru to help with technical questions. Keeping up to date with all the latest games and Apps is a challenge for any parent. The following website has parent guides to the most popular games, Apps and social networking sites. It is updated regularly as these change.